PRESENTATION OF THE INNOVATIVE PROJECT. 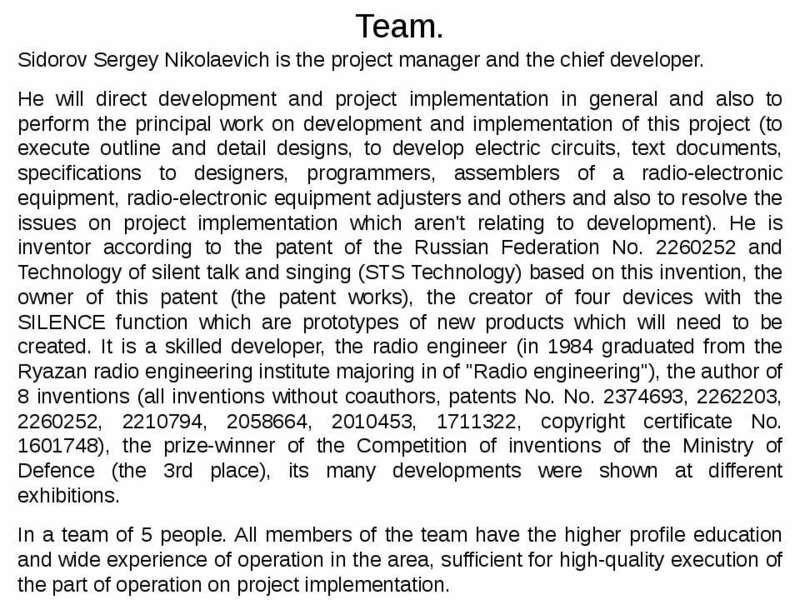 Patent RU No. 2260252. Author: Sidorov S.N. 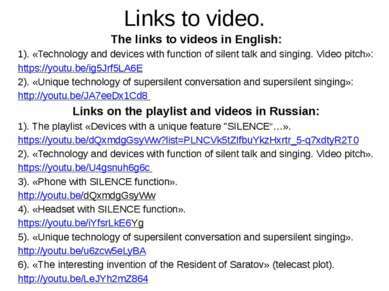 Technology of the silent talk and singing. 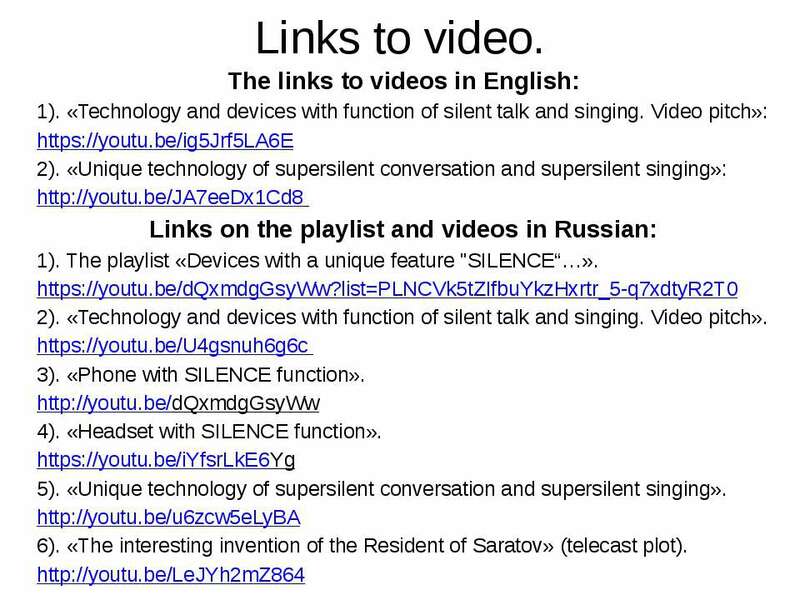 Devices with function of the silent talk and singing (communication devices, device audio, new types of devices). UNIQUENESS (THERE ARE NO ANALOGUES). A LOT OF NEW OPPORTUNITIES. A LOT OF SCOPES. POTENTIAL OF MASS USE. HUGE COMMERCIAL POTENTIAL. THE TECHNOLOGY CHANGING OUR LIFE! Project purpose. 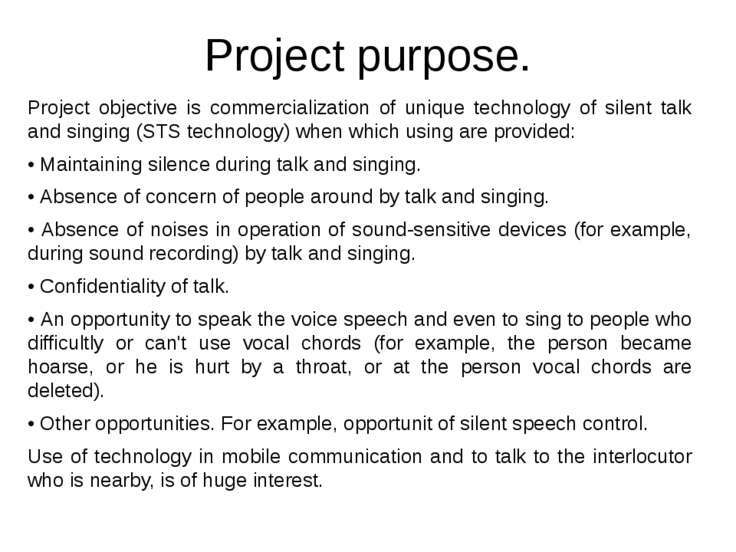 Project objective is commercialization of unique technology of silent talk and singing (STS technology) when which using are provided: • Maintaining silence during talk and singing. • Absence of concern of people around by talk and singing. 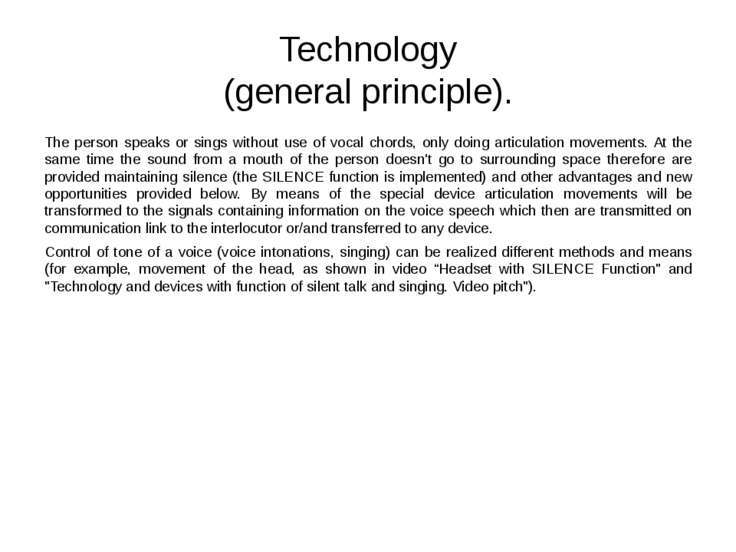 • Absence of noises in operation of sound-sensitive devices (for example, during sound recording) by talk and singing. 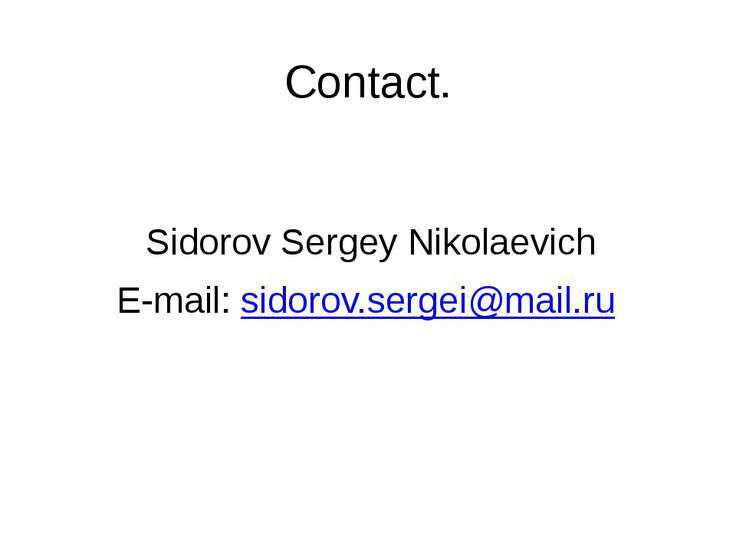 • Confidentiality of talk. • An opportunity to speak the voice speech and even to sing to people who difficultly or can't use vocal chords (for example, the person became hoarse, or he is hurt by a throat, or at the person vocal chords are deleted). • Other opportunities. For example, opportunit of silent speech control. Use of technology in mobile communication and to talk to the interlocutor who is nearby, is of huge interest. Legal protection. 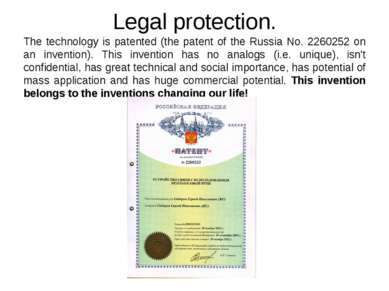 The technology is patented (the patent of the Russia No. 2260252 on an invention). This invention has no analogs (i.e. unique), isn't confidential, has great technical and social importance, has potential of mass application and has huge commercial potential. This invention belongs to the inventions changing our life! Technology (general principle). The person speaks or sings without use of vocal chords, only doing articulation movements. 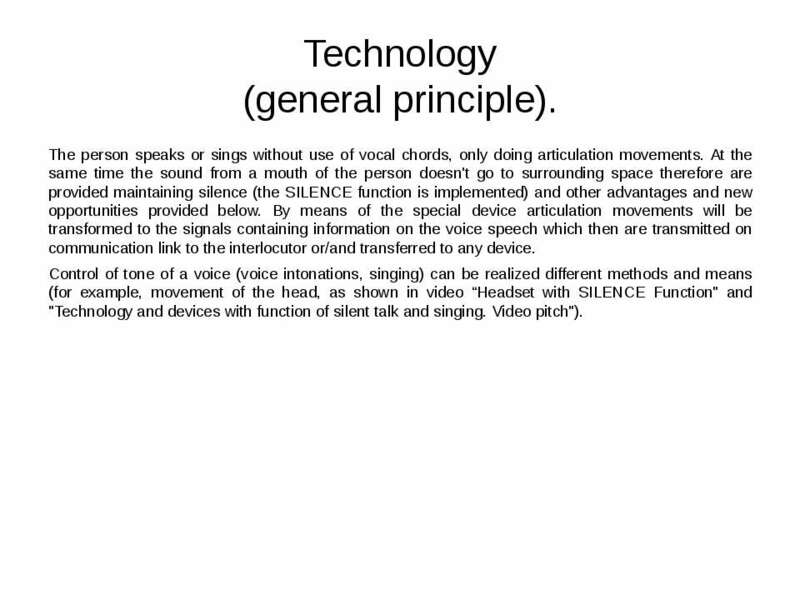 At the same time the sound from a mouth of the person doesn't go to surrounding space therefore are provided maintaining silence (the SILENCE function is implemented) and other advantages and new opportunities provided below. 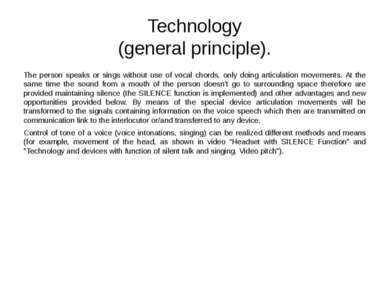 By means of the special device articulation movements will be transformed to the signals containing information on the voice speech which then are transmitted on communication link to the interlocutor or/and transferred to any device. Control of tone of a voice (voice intonations, singing) can be realized different methods and means (for example, movement of the head, as shown in video “Headset with SILENCE Function" and "Technology and devices with function of silent talk and singing. 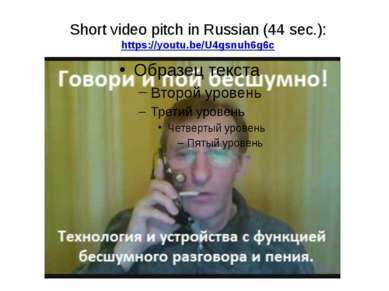 Video pitch"). 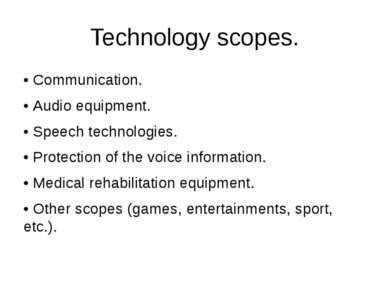 Technology scopes. • Communication. • Audio equipment. • Speech technologies. 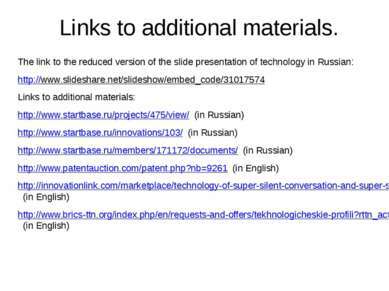 • Protection of the voice information. • Medical rehabilitation equipment. • Other scopes (games, entertainments, sport, etc.). Types of products. 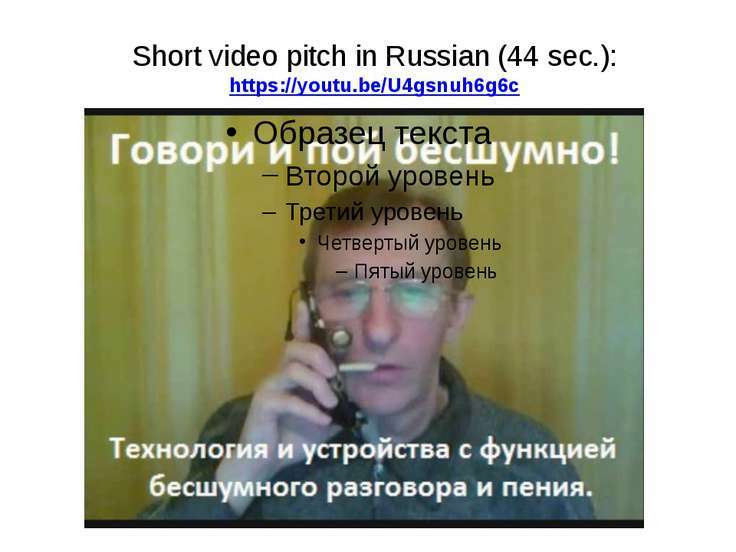 • Communicating devices, for example, phones of any type, smartphones, communicators, pads, radio stations, different intercoms, covers with the SILENCE function for different devices (for example, for smartphones). 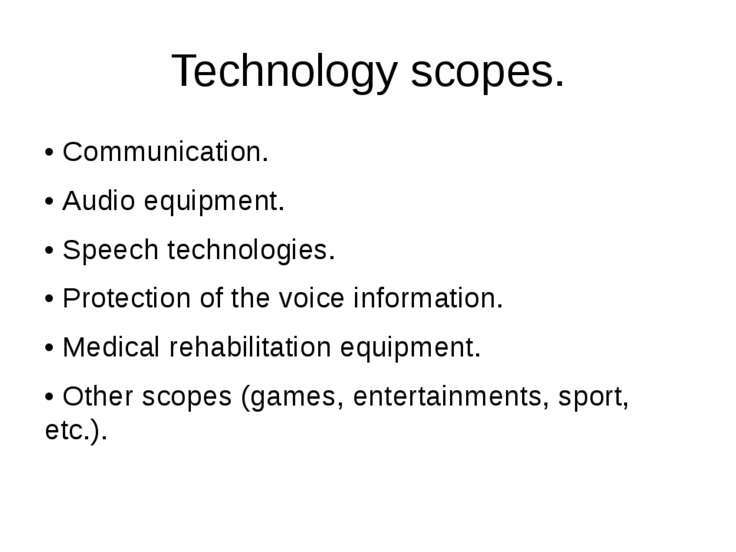 • Device audio, for example, headsets, microphones, voice recorders, voice-forming devices for disabled people and not disabled people. 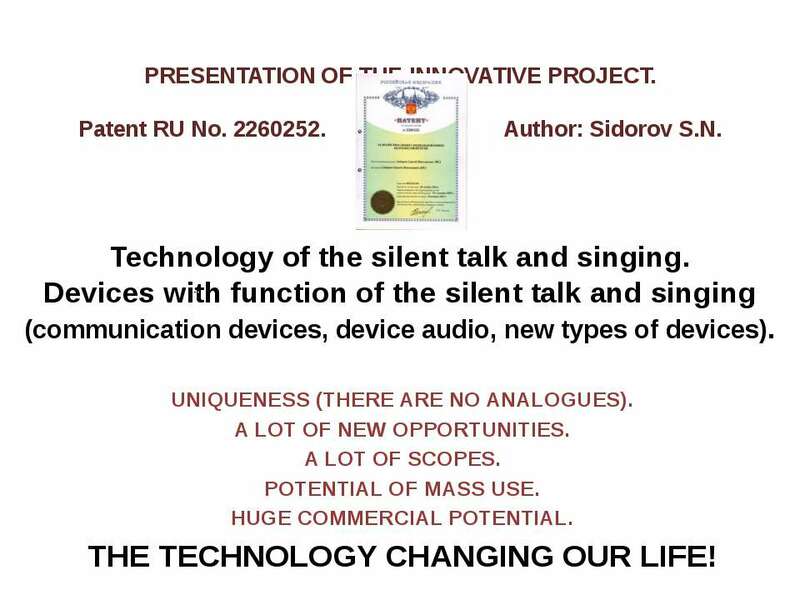 • New types of devices, for example, devices of silent talk and silent singing (that it was possible to speak and sing silently and confidentially by any voice, without concern of people around and without noise in operation of sound-sensitive devices), new types of vocal devices, game devices, devices for entertainments and for sport, the device of silent speech control. 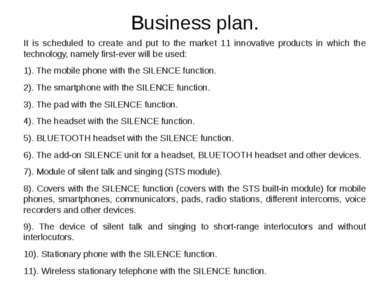 Mobile and other phones, smartphones, communicators, pads, radio stations, different intercoms, voice recorders, headsets and microphones will have additional function of silent talk and silent singing (SILENCE function). 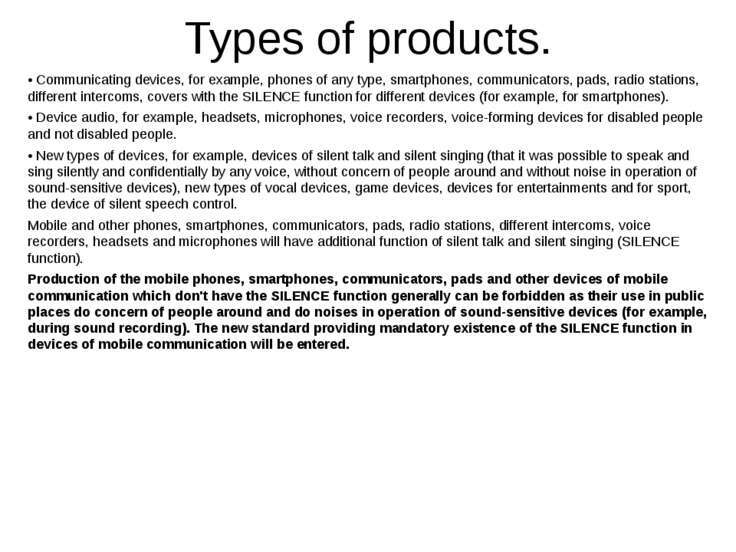 Production of the mobile phones, smartphones, communicators, pads and other devices of mobile communication which don't have the SILENCE function generally can be forbidden as their use in public places do concern of people around and do noises in operation of sound-sensitive devices (for example, during sound recording). 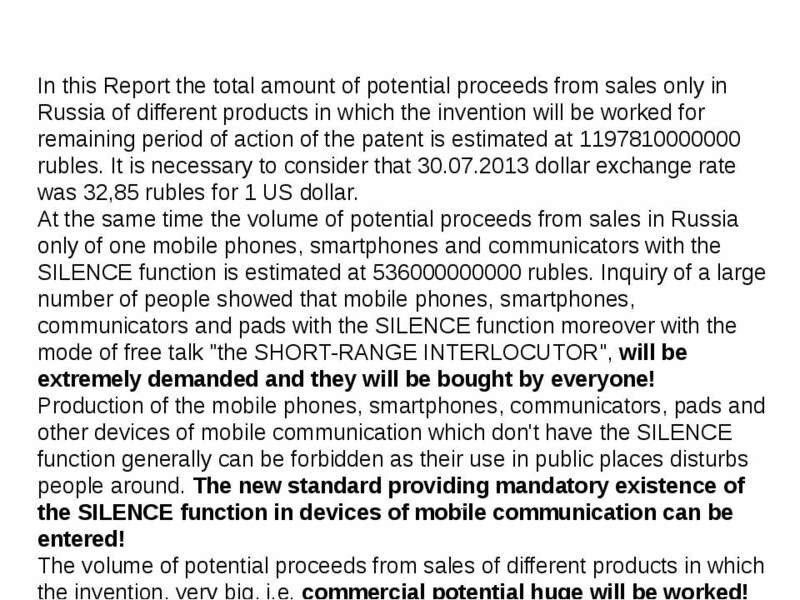 The new standard providing mandatory existence of the SILENCE function in devices of mobile communication will be entered. 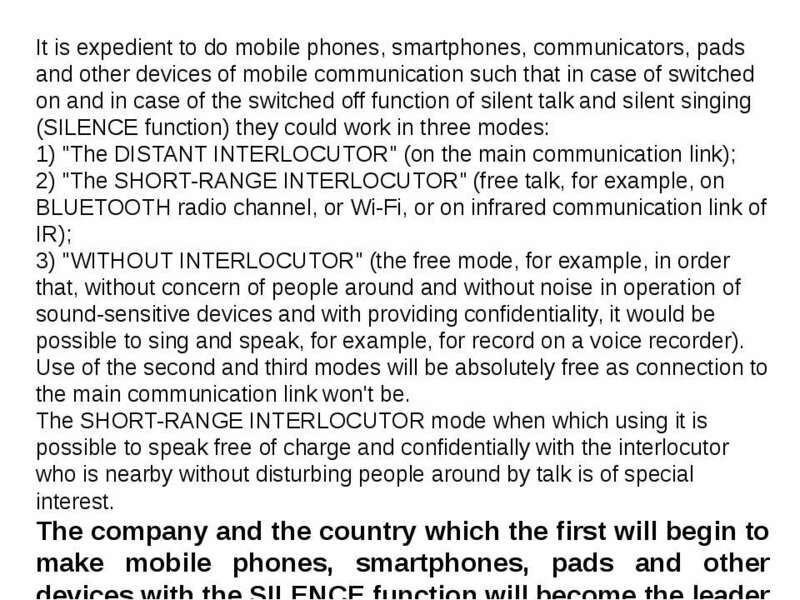 It is expedient to do mobile phones, smartphones, communicators, pads and other devices of mobile communication such that in case of switched on and in case of the switched off function of silent talk and silent singing (SILENCE function) they could work in three modes: 1) "The DISTANT INTERLOCUTOR" (on the main communication link); 2) "The SHORT-RANGE INTERLOCUTOR" (free talk, for example, on BLUETOOTH radio channel, or Wi-Fi, or on infrared communication link of IR); 3) "WITHOUT INTERLOCUTOR" (the free mode, for example, in order that, without concern of people around and without noise in operation of sound-sensitive devices and with providing confidentiality, it would be possible to sing and speak, for example, for record on a voice recorder). 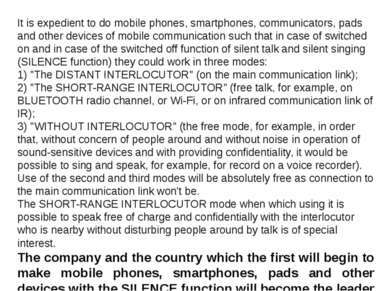 Use of the second and third modes will be absolutely free as connection to the main communication link won't be. The SHORT-RANGE INTERLOCUTOR mode when which using it is possible to speak free of charge and confidentially with the interlocutor who is nearby without disturbing people around by talk is of special interest. 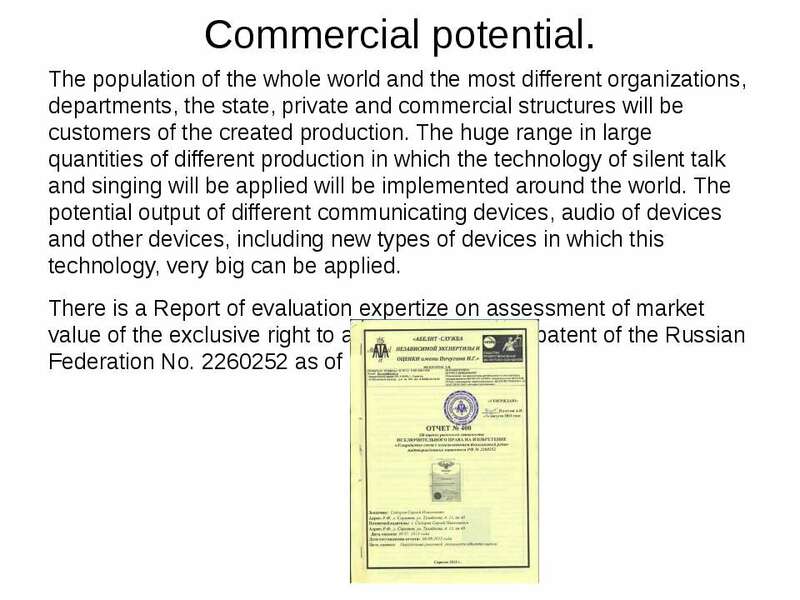 The company and the country which the first will begin to make mobile phones, smartphones, pads and other devices with the SILENCE function will become the leader in the world market of devices of mobile communication and many other devices! Prototypes. Are made first-ever: • Phone with the additional SILENCE function. • Headset with the additional SILENCE function. • The add-on "SILENCE“ unit to a normal typeface and other devices. 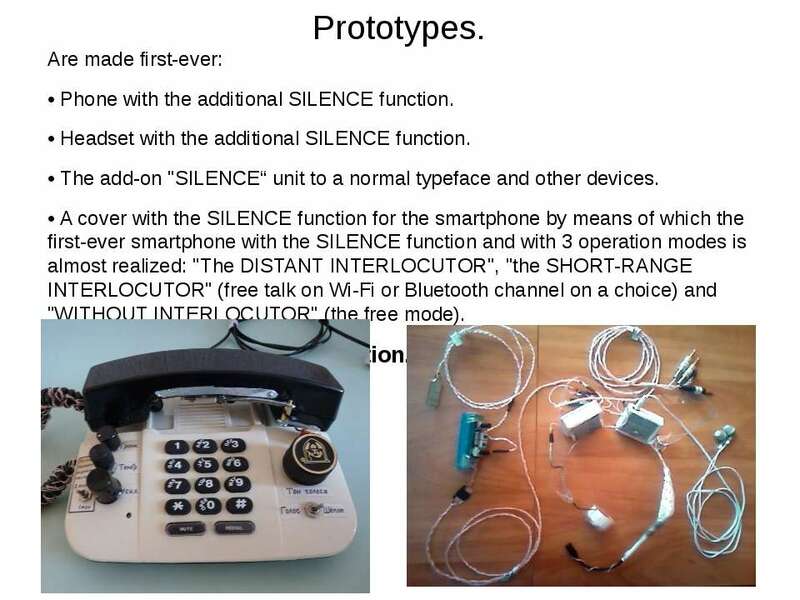 • A cover with the SILENCE function for the smartphone by means of which the first-ever smartphone with the SILENCE function and with 3 operation modes is almost realized: "The DISTANT INTERLOCUTOR", "the SHORT-RANGE INTERLOCUTOR" (free talk on Wi-Fi or Bluetooth channel on a choice) and "WITHOUT INTERLOCUTOR" (the free mode). Phone with the SILENCE function. 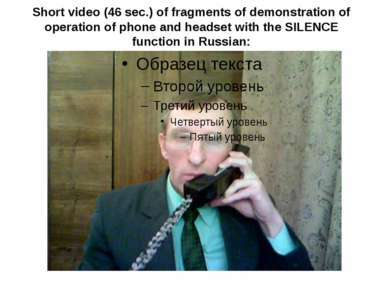 Headset with the SILENCE function. The add-on "SILENCE“ unit. The add-on "SILENCE“ unit with the connected headset. The smartphone in a cover with the SILENCE function. 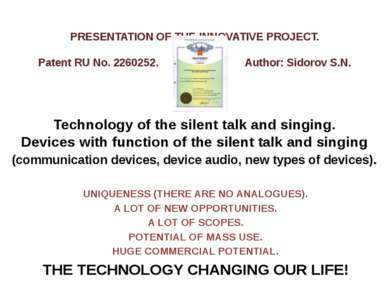 The smartphone is ready to use of the SILENCE functions. The first 3 prototypes were shown at the Startup Bazaar 2017 exhibition at the Startup Village 2017 conference in Skolkovo. Commercial potential. The population of the whole world and the most different organizations, departments, the state, private and commercial structures will be customers of the created production. 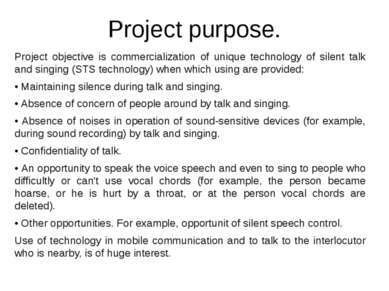 The huge range in large quantities of different production in which the technology of silent talk and singing will be applied will be implemented around the world. 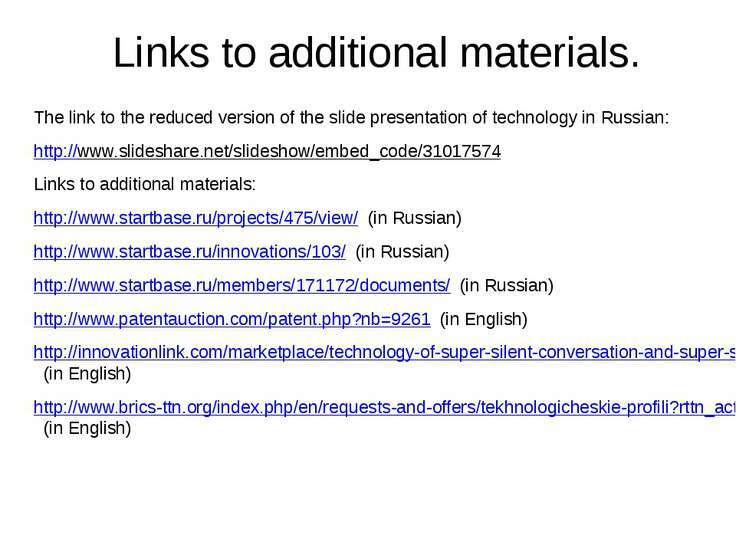 The potential output of different communicating devices, audio of devices and other devices, including new types of devices in which this technology, very big can be applied. 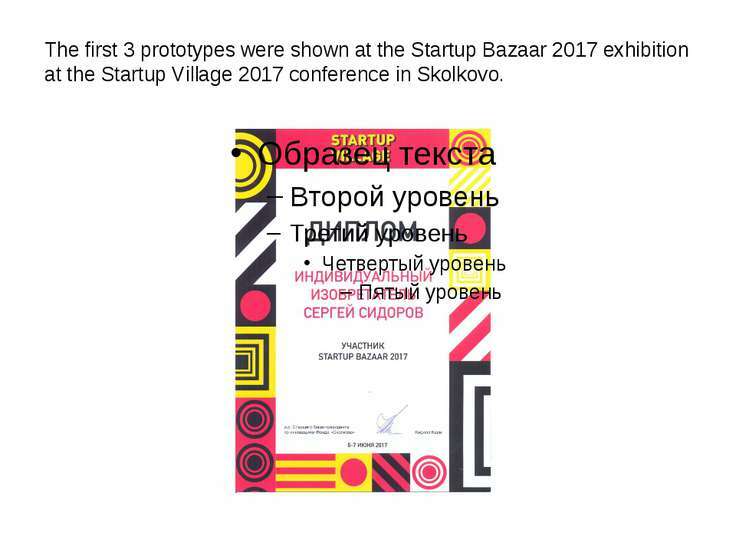 There is a Report of evaluation expertize on assessment of market value of the exclusive right to an invention on the patent of the Russian Federation No. 2260252 as of 30.07.2013. In this Report the total amount of potential proceeds from sales only in Russia of different products in which the invention will be worked for remaining period of action of the patent is estimated at 1197810000000 rubles. It is necessary to consider that 30.07.2013 dollar exchange rate was 32,85 rubles for 1 US dollar. 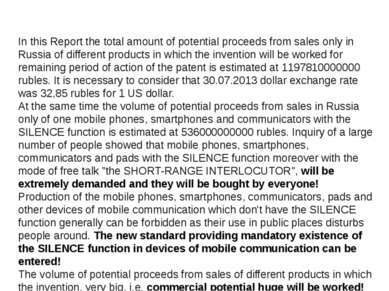 At the same time the volume of potential proceeds from sales in Russia only of one mobile phones, smartphones and communicators with the SILENCE function is estimated at 536000000000 rubles. Inquiry of a large number of people showed that mobile phones, smartphones, communicators and pads with the SILENCE function moreover with the mode of free talk "the SHORT-RANGE INTERLOCUTOR", will be extremely demanded and they will be bought by everyone! 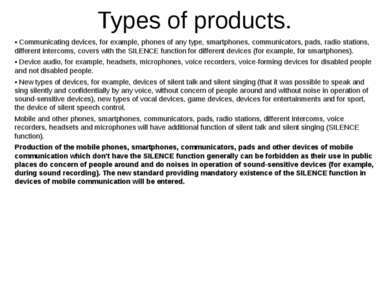 Production of the mobile phones, smartphones, communicators, pads and other devices of mobile communication which don't have the SILENCE function generally can be forbidden as their use in public places disturbs people around. The new standard providing mandatory existence of the SILENCE function in devices of mobile communication can be entered! The volume of potential proceeds from sales of different products in which the invention, very big, i.e. commercial potential huge will be worked! Business plan. It is scheduled to create and put to the market 11 innovative products in which the technology, namely first-ever will be used: 1). The mobile phone with the SILENCE function. 2). 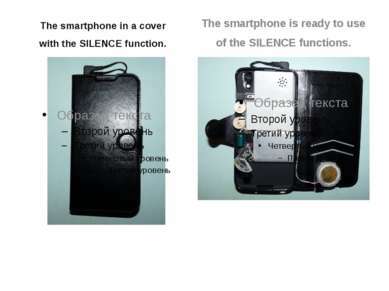 The smartphone with the SILENCE function. 3). The pad with the SILENCE function. 4). 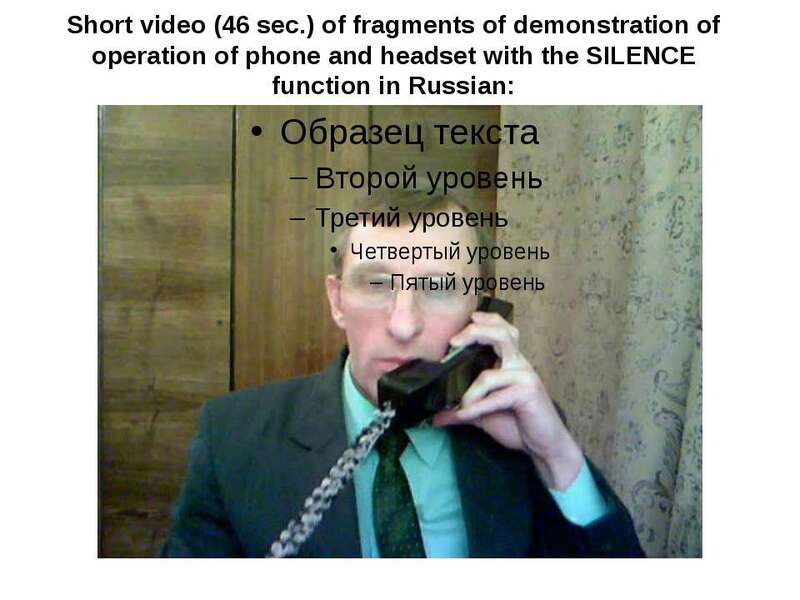 The headset with the SILENCE function. 5). 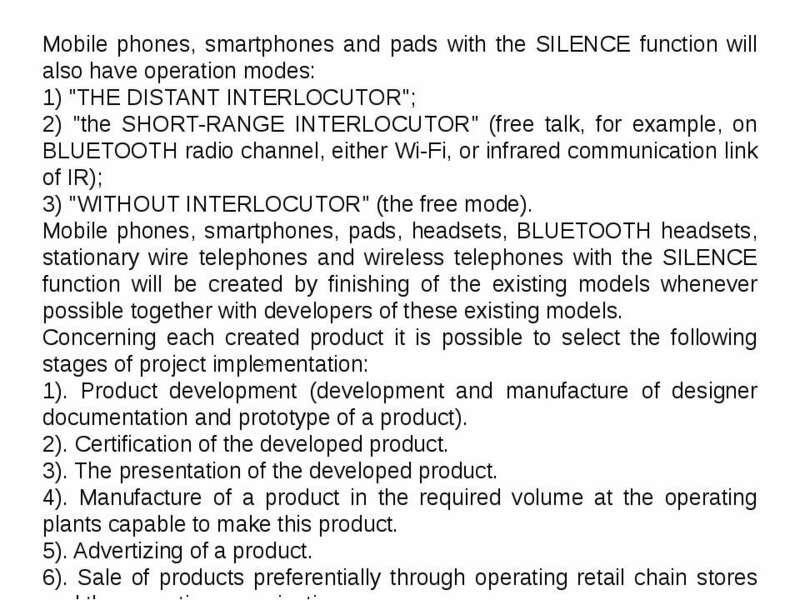 BLUETOOTH headset with the SILENCE function. 6). 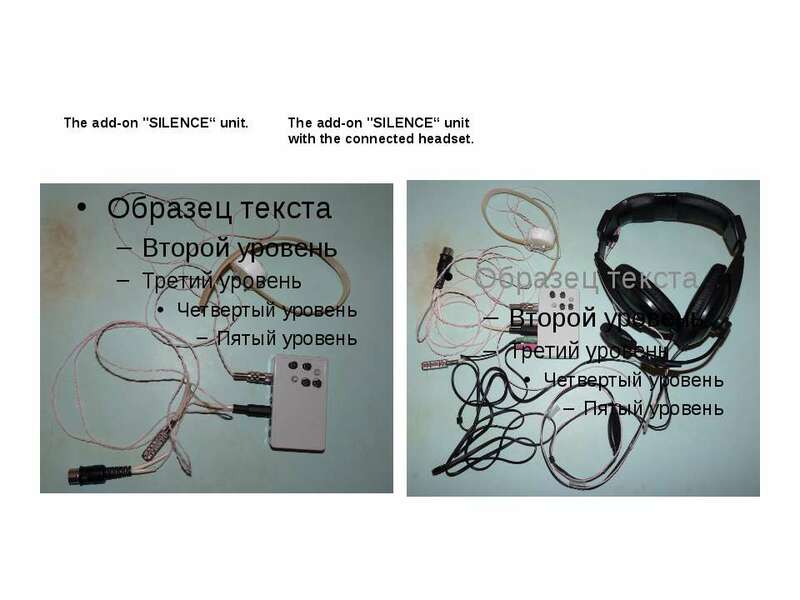 The add-on SILENCE unit for a headset, BLUETOOTH headset and other devices. 7). 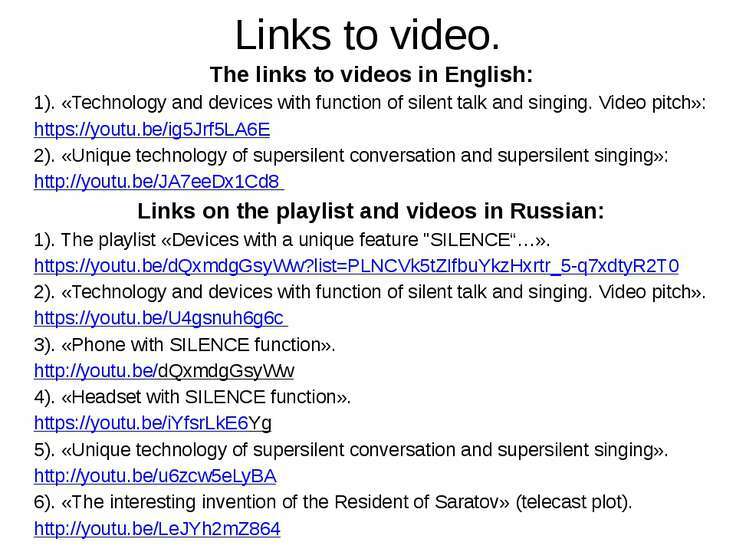 Module of silent talk and singing (STS module). 8). Covers with the SILENCE function (covers with the STS built-in module) for mobile phones, smartphones, communicators, pads, radio stations, different intercoms, voice recorders and other devices. 9). 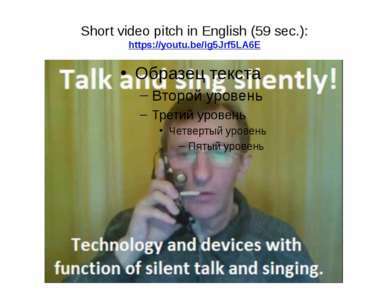 The device of silent talk and singing to short-range interlocutors and without interlocutors. 10). Stationary phone with the SILENCE function. 11). 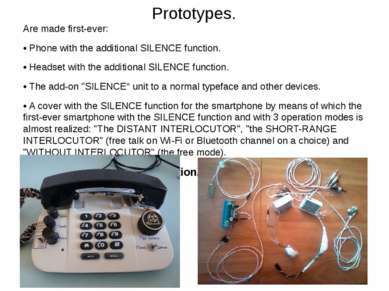 Wireless stationary telephone with the SILENCE function. Mobile phones, smartphones and pads with the SILENCE function will also have operation modes: 1) "THE DISTANT INTERLOCUTOR"; 2) "the SHORT-RANGE INTERLOCUTOR" (free talk, for example, on BLUETOOTH radio channel, either Wi-Fi, or infrared communication link of IR); 3) "WITHOUT INTERLOCUTOR" (the free mode). 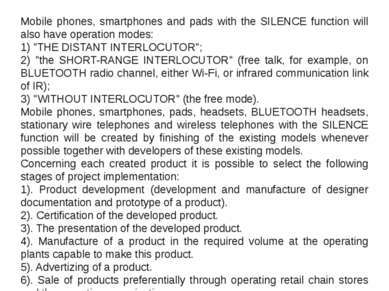 Mobile phones, smartphones, pads, headsets, BLUETOOTH headsets, stationary wire telephones and wireless telephones with the SILENCE function will be created by finishing of the existing models whenever possible together with developers of these existing models. Concerning each created product it is possible to select the following stages of project implementation: 1). Product development (development and manufacture of designer documentation and prototype of a product). 2). 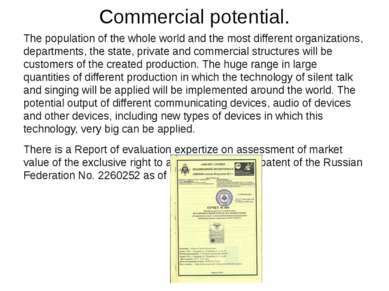 Certification of the developed product. 3). The presentation of the developed product. 4). Manufacture of a product in the required volume at the operating plants capable to make this product. 5). Advertizing of a product. 6). Sale of products preferentially through operating retail chain stores and the exporting organizations. 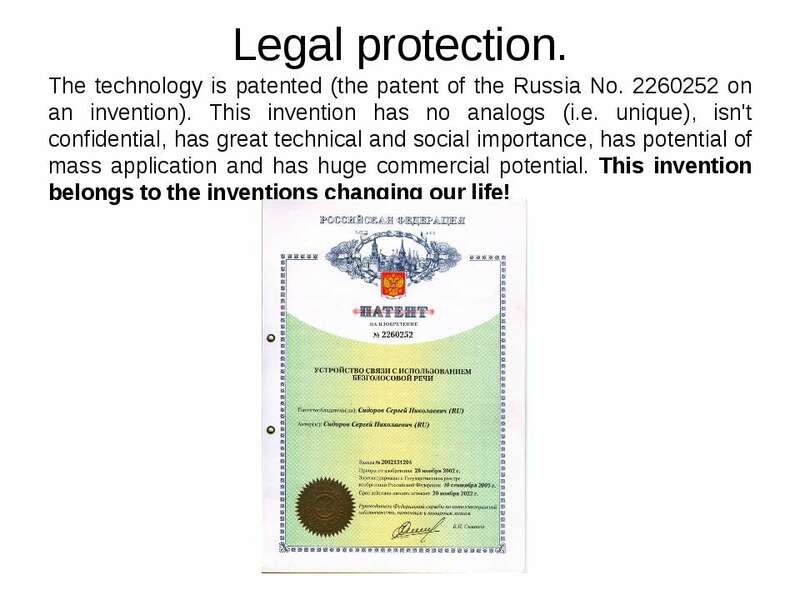 Thanks to the exclusive right to an invention in Russia will be on sale and also to be exported abroad, production only belonging to us in which this invention will be worked! Team. 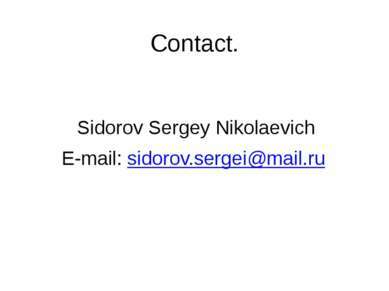 Sidorov Sergey Nikolaevich is the project manager and the chief developer. He will direct development and project implementation in general and also to perform the principal work on development and implementation of this project (to execute outline and detail designs, to develop electric circuits, text documents, specifications to designers, programmers, assemblers of a radio-electronic equipment, radio-electronic equipment adjusters and others and also to resolve the issues on project implementation which aren't relating to development). 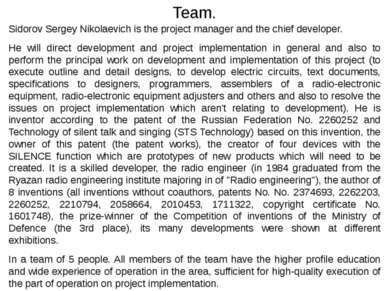 He is inventor according to the patent of the Russian Federation No. 2260252 and Technology of silent talk and singing (STS Technology) based on this invention, the owner of this patent (the patent works), the creator of four devices with the SILENCE function which are prototypes of new products which will need to be created. It is a skilled developer, the radio engineer (in 1984 graduated from the Ryazan radio engineering institute majoring in of "Radio engineering"), the author of 8 inventions (all inventions without coauthors, patents No. No. 2374693, 2262203, 2260252, 2210794, 2058664, 2010453, 1711322, copyright certificate No. 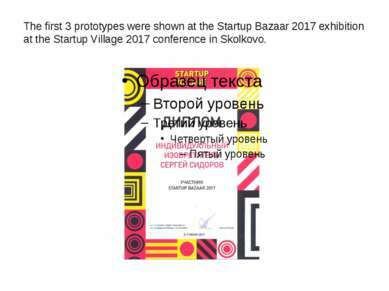 1601748), the prize-winner of the Competition of inventions of the Ministry of Defence (the 3rd place), its many developments were shown at different exhibitions. In a team of 5 people. All members of the team have the higher profile education and wide experience of operation in the area, sufficient for high-quality execution of the part of operation on project implementation.